From Taiwan, we are the credible Manufacturer, Exporter & Supplier of the top-tier Automatic Plastic Sole Injection Molding Machine world-over. Making innovation & quality as our foremost priority, we have designed these Station Unit Plastic Sole Injection Molding Machines. Compliant with the established industry standards, these Machines assure to render impeccable performance for a long span. Avail the Automatic Plastic Sole Injection machine (PS-98) from us at competitive prices. Suitable for PVC. TPR foaming or non-foaming material for sole injection. One time one pair injection. Available for color insert arrangement. Screw diameter 65mm dia. x 1. Max. 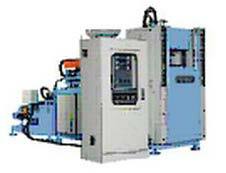 Mould Stations single station, one station for one pair injection.